Let me start this off by saying I have nothing against the handicapped but it’s clear they’ve angered our gods in some way, and showing them any kind of sympathy is tantamount to blasphemy. While the rest of us bask in the glories of natural bi-pedal locomotion, these faithless humps are forced to make due with a series of prosthetics, and the worst of all of them is Oscar Pistorius. Not content to get one of those little wooden boxes with wheels and pull himself along streets begging for change like a normal amputee, he went out and got him some fancy new legs. These carbon-fiber miracles of science are called Flex-Foot Cheetahs, but they’re more like flex foot cheaters if you ask me. 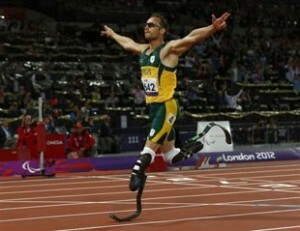 Pistorius uses these artificial legs to run in races against non-cripples, and that’s ridiculous. They undoubtedly give him a technical advantage over the black sprinters who developed their speed the old fashioned way. Their ancestors were chased by actual cheetahs for thousands of years, and all the slow ones were eaten. Now, like all handicapped people, Mr. Pistorius’ true nature has shown through, and the darling of international sports is accused of murdering his hot, non-handicapped girlfriend. Did he do it? Well, I have absolutely no facts or knowledge about the case, but I feel very comfortable saying yes, he probably did it. They’re naturally devious, these handicapped people, and I’d put nothing past them.